I have owned this jeep since 1983. It was raced in mud pits before I purchased it. Each year I take on another part of the restoration. All that remains is the upholstery at this point. 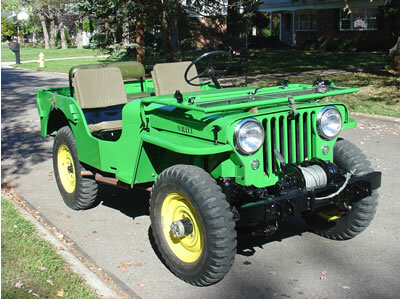 This jeep known as BOB (Best Of Best) has been on 5 of the 6 Ohio FFF (Flat Fender Frenzy). It is a stock CJ2A. In 2005 its sheet metal was professionally rebuilt using replacement panels. The color is pasture green which is about 3 shades lighter than J.Deer Green. BOB runs as good he looks.